In honor of throwback Thursday... I'm going to continue my roll out of Portraits from the 2014 Newport Folk Festival. 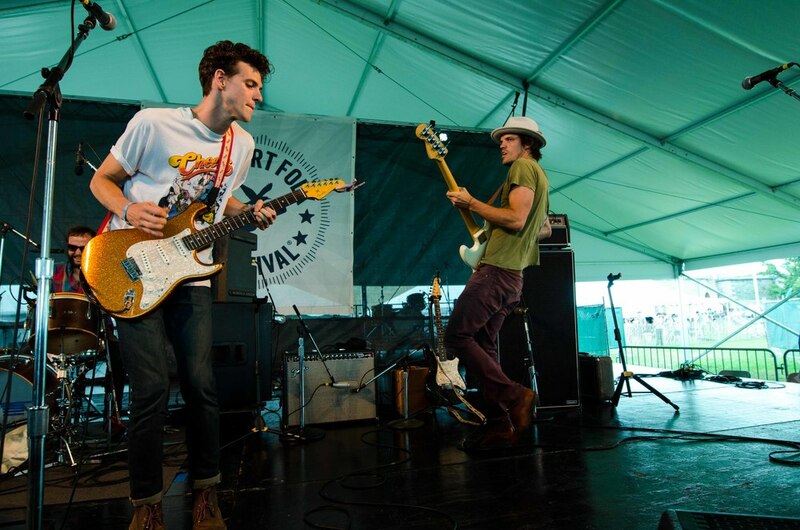 Todays artist will be none other than Houndmouth. Their melting of 2 male vocalists and a soulfully sweet female vocalist, gives off similarities to The Head and The Heart and Of Monsters and men, but once you hear the dark lyrics layered in thier upbeat folk songs, you realize thats where the similarities end. I met the band underneath the flag pole of the fort, ready to bring them into the heart of Fort Adams. I had two different spots in mind for the Portraits both with varying amounts of natural light and spacially different to allow for 2 completely different shots for me to choose from later. To be honest i was shocked that one of the Portraits came out as good as it did due to the lack of light. These guys couldn't have been nicer, its great to meet musicians that are just genuinely there to have fun. One of the band members, Zach actually rode around the area that we were doing portraits in, in a motorized schooner we found lying around.